(Kyodo News/Singapore): The 16 mostly Asian countries negotiating what would be the world’s largest free trade area made some progress in their latest round of talks on Saturday, but are still struggling to strike a trimmed-down deal by the end of this year, according to a joint statement issued after a one-day meeting Saturday. "The ministers agreed to work together to overcome any difficulty or challenge as the RCEP negotiations enter into the last mile," the statement said. 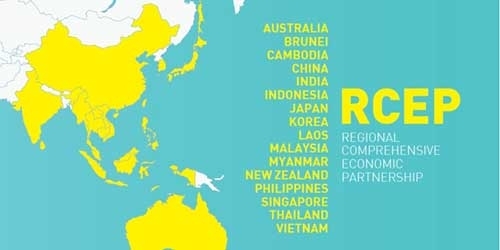 Negotiations towards signing a Regional Comprehensive Economic Partnership (RCEP) free trade pact started in 2013 but have failed to meet agreement deadlines a number of times. The statement said that while there has been "some narrowing of gaps," differences remain. Yet RCEP members are still resolved to complete by year-end the package outlined in August, it said, adding sealing a free trade pact would be "an important milestone, particularly at the time of uncertainties in global trade." At their last gathering in August, the RCEP trade ministers adopted a package of deliverables that they hoped to achieve by year-end, and that would "signify the substantial conclusion of the RCEP negotiations." New Zealand Trade Minister David Parker said after the meeting that "there was some progress made." However, he added that "the final offer has not yet been made on market access on goods, services and investments." Still, Parker said, "the ministers gave a clear message to officials that if possible, the parties want to reach substantial conclusion by the end of the year." "Everyone agrees to negotiate further towards substantial conclusion and intensify market access negotiations," a Malaysian official said. The one-day meeting at a hotel in Singapore ended at about 3pm, a few hours earlier than scheduled. A Singapore official said that RCEP chief negotiators will meet again in Auckland later this month. And the statement said the trade ministers will meet again — to prepare for a RCEP leaders’ summit next month, on the sidelines of the annual gathering of leaders of the 10-member states of the Association of Southeast Asian Nations Summit and regional powers. Prior to Saturday’s meeting, Norazman Ayob, deputy secretary general in charge of trade of the Malaysian Ministry of International Trade and Industry, was quoted by The Star newspaper there as saying the severe trade friction between China and the United States was an impetus to conclude the RCEP free trade pact. However, Norazman said, concluding the pact by year-end was challenging due to differing levels of development among the countries involved, and political factors including general elections next year in India and Australia.